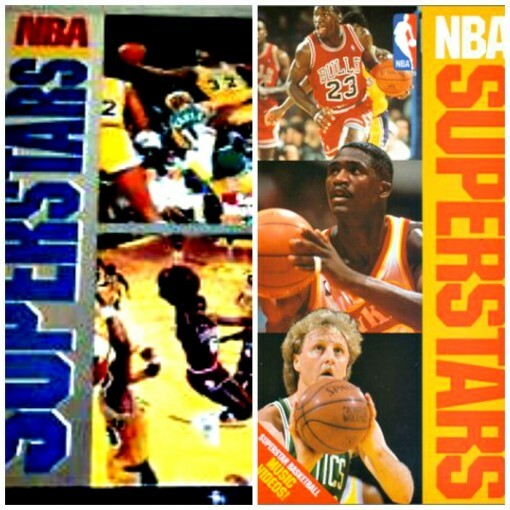 Remember the NBA Superstars video VHS from the 1980’s? If you grew up in the 1980’s obsessed with the NBA and owned a VCR then you had an NBA Superstars VHS tape sitting next to Caddyshack and Airplane! NBA Superstars was the late-1980s version of a YouTube mix; a perfect blend of the NBA and MTV (when MTV played music videos). If I recall correctly, the videotape was first given away during a Sports Illustrated promotion and then officially released in 1990. The full version of the videotape featured 13 highlight clips and mixes of the top NBA players in that day: Magic Johnson, Larry Bird, Michael Jordan, Isiah Thomas, Akeem Olajuwon, Dominique Wilkins, Charles Barkley, and more: all set to a diverse soundtrack that mixed rock, rap, pop and even country. And in probably the uncoolest thing the NBA has ever done is set a Dominique Wilkins highlight video to Yanni’s “Looking Glass” (yet, it worked somehow). The set up of the video is actually kind of cool, but it spends nearly half of the video before getting to the actual highlights for the Human Highlight Film. The video also included lame music videos for Julius “Dr. J” Erving (“Greatest Love of All” by Whitney Houston), Kareem Abdul-Jabbar (I’m So Happy), and another couple cool compilation mixes featuring NBA legends (“This Is The Time” by Billy Joel) and the smaller players in the NBA (“Tuff Enuff” by the Thuderbirds). I can’t even tell you how many times I played this tape (skipping the Jabbar and Dr. J videos). Rewound it. Watched it again. Rewound it. Watched it again. Rewound it. Watched it again. If I was to guess, I would say that I watched the some of the videos more than 500 times. The original Superstars video was such a success that the NBA released volume 2 and volume 3, both of which were lacking and over thought (yet somehow less polished). Volume 2 had the stars (Scottie Pippen, Chris Mullin, Karl Malone, and Patrick Ewing), though it was an admirable attempt, it missed the mark. Given the bar was set so high with the first volume. Perhaps it lacked Sports Illustrated’s influence? Volume three was completely laughable and clearly trying too hard, especially looking back on some of the players it featured: Larry Johnson, Dan Majerle, and Kenny Anderson (ack!). Not only were they not “legends,” they were barely superstars, but the videos were forgettable. Being the NBA freak that I was, I probably watched this video at least 30 times and I can’t recall any of it. Very much like the “Dream Teams” that followed the original 1992 Olympic squad, the second and third videos never came close to re-capturing the magic of the first NBA Superstars collection.